"I ain't running this time. I ain't scared." 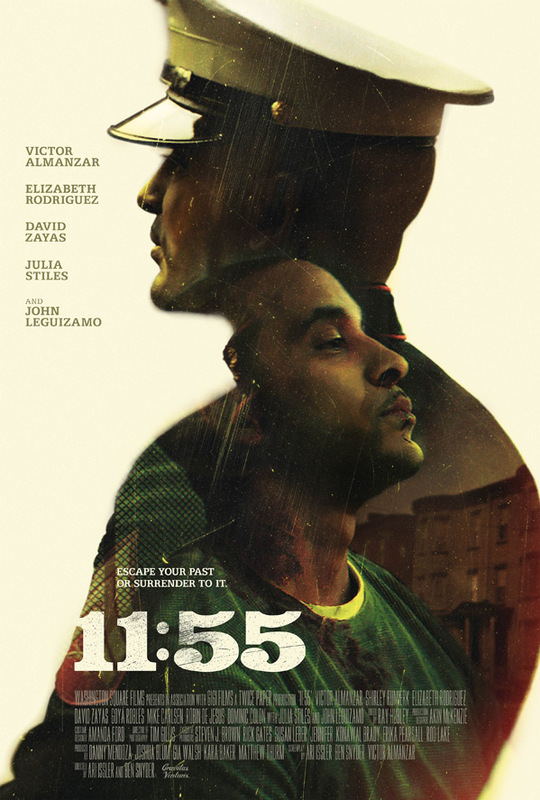 Gravitas Ventures has debuted the first official trailer for an indie thriller titled 11:55, starring actor Victor Almanzar from "Empire" and "Chicago P.D." as a young marine returning to his small hometown. The title is in reference to 11:55 bus, which is arriving with the person who is out to kill our young marine who finally returns home safe. The film premiered at the 2016 Los Angeles Film Festival, and also played at the Seattle and Austin Film Festivals last year. This also stars Elizabeth Rodriguez, David Zayas, Julia Stiles, Shirley Rumierk, Robin de Jesus, Mike Carlsen, and John Leguizamo. This looks like it could be good, I'm intrigued to check it out sometime soon. Give it a watch. After being involved in the fatal shooting of a local drug dealer, U.S. Marine Nelson Sanchez (Victor Almanzar) returns to the neighborhood he fled years ago. Amid the fanfare and celebration on his homecoming from Afghanistan, the brother of the deceased learns of Nelson’s return and vows revenge. When word reaches Nelson that his would-be killer is due on the 11:55 bus, he decides to protect himself and his family and make a stand. Nelson seeks out assistance from a fellow Marine vet, (John Leguizamo) and asks his drug-dealing godfather (David Zayas) to broker peace. As the clock ticks down, Nelson charts an unlikely path to break the cycle of the violence that has defined his life. 11:55 is directed by Ari Issler & Ben Snyder, both making their directorial debut after other work in films. The script is written by Ari Issler & Ben Snyder & Victor Almanzar. Gravitas Ventures will release 11:55 in theaters starting June 9th.